Subgroup: Masterpiece Toys R Us exclusive $69.99 USD new. Weakness offends Grimlock. He considers none so weak as those who refuse to use their full strength to command victories. As a result, he never had much respect for Optimus Prime. He barely even considered himself and his Dinobots to be part of the Autobot army most of the time. The tyranny of Megatron offends him even more than weakness. He longs for the day when Optimus Prime makes a final mistake, leaving a vacancy that Grimlock will be more than happy to fill. "Among the winners, there is no room for the weak"
Most fearsome and powerful Dinobot. Although dedicated to the Autobot cause, resents authority. Cold, merciless, but a valiant warrior. Has contempt for the weak, including all humans. Great strength, uses his jaws to break almost everything in two. Carries energo sword and galaxial rocket launcher in Dinotbot mode. Other than arrogance and lack of speed, has no real weakness. As one notices, the major difference includes an evolution of character and toy line. The Masterpiece series has been a pleasant addition for collectors world-wide, but I think the series was introduced with Optimus Prime and none of the figures since have come close to the mastery as Optimus Prime. Well, that is, until now. Masterpiece Grimlock presents a fantastic update to the beloved G1 figure. As a Toys R Us exclusive in the United States, Grimlock carries a hefty $69.99 price tag, but that is actually inexpensive when compared to the import prices of the Japanese versions, which range from $95 up to $230 depending on whether you want the exclusive or the King Grimlock version. 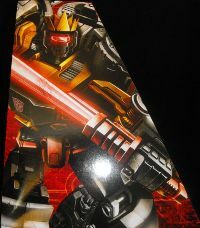 The Toys R Us version includes the Dinobot Crown of Leadership, glowing sword and blaster. 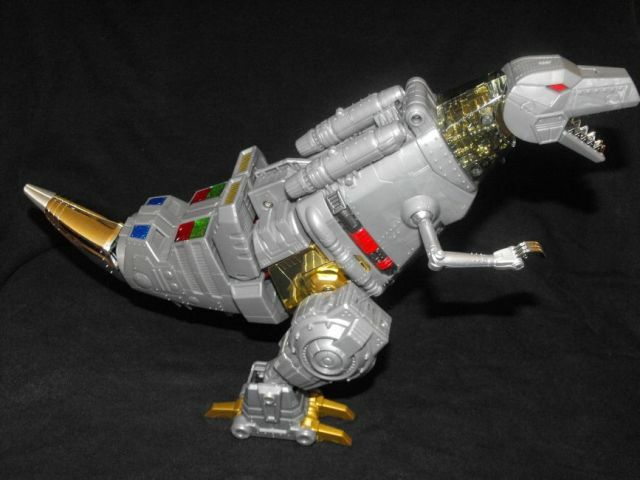 While the Masterpiece refers to Grimlock's alternative mode as simply Dinobot mode, Grimlock looks like an upgraded Cybernetic T-rex from the G1 version. Some nifty features about the Dinobot mode include chrome parts, great posability from the legs, Dinobot arms and the head. The legs pivot at the hip joints, rotate at the thighs, bend at the knees, and the claws move out and down as well. Imagine the scene from Transformers movie where Grimlock jumps up and thrashes down on Devastator! The gimpy hands of the T-rex are also articulated with 360 degree rotation at the "shoulder" and the elbows also bend. The three claws on the "hands" are chromed out and articulated as well. Grimlock's head rotates and the jaws open wide to reveal chromed out mechano-shredders of teeth. Tucked inside his mouth is the infamous fire blaster (although this is not advertised on the packaging at all, but we all know the Dinobots were flame-throwing fools). Last but not least, Grimlock's skull opens to reveal a nifty gadget: there is a "pinwheel" that rotates on a spring loaded mechanism that allows you to change his eyes from blue to red. I think this add on for the eyes is pretty cool since the toys show red/blue eyes but the television showed Grimlock with blue eyes. 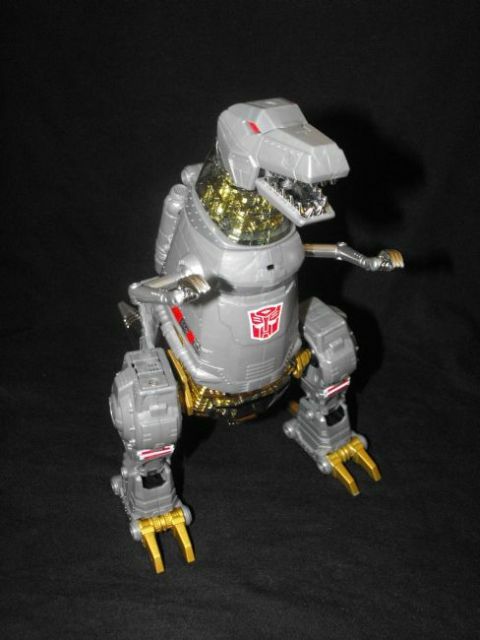 Grimlock's Dinobot mode portrays the character true to form. The details of the design are highly detailed. For example, Grimlock's Dinobot neck has gold mechanics with clear overlay. The tail has a chrome section that adds to the details and a tribute to the chrome goodness of the G1. 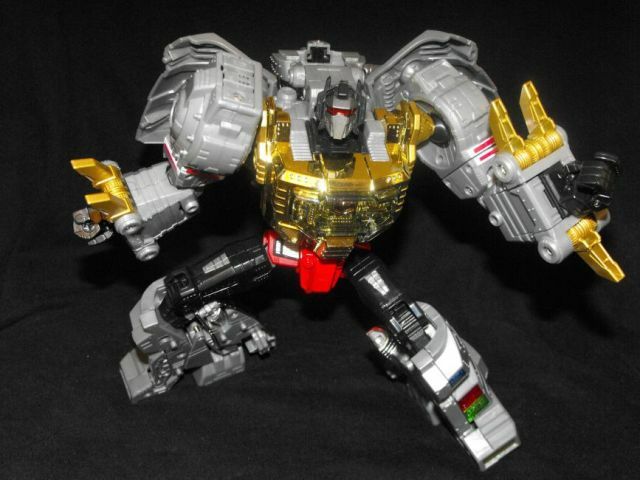 One thing from looking at pictures of the Japanese version, it seems that the Dinobot arms are all chrome with that version, where this version is a metallic gray with chrome figures. Ah well, the nuances are worth the price difference as the quality of Grimlock offsets any minor differences. Ok, so Grimlock's robot mode. Well about that... No, really about that. Yeah, I'm going to need you to come in on Saturday and work on those TPS reports. Great googly, moogly, Grimlock's robot mode is fantastic. Sure the buzz around the internet is that he is rather short and should have been larger for the price, but honestly, they are not making the toys on any sort of scale to character imagination, they are making the toys to scale of about how much can they squeeze in the box and how much will it costs to ship it. Grimlock is rather stocky for his size (about 8 and 1/2" tall) and is considerably heft, so it feels like a brick when you pick him up. Oddly enough, the weight has always been something of a factor to the bot's allure. Anyway, there are a few cool features about Grimlock. Couple of gimmicks that seem cool on Grimlock. First, as you transform grimlock, his chest has a see-through panel where the Autobot symbol moves up into place. Thought that was rather interesting. 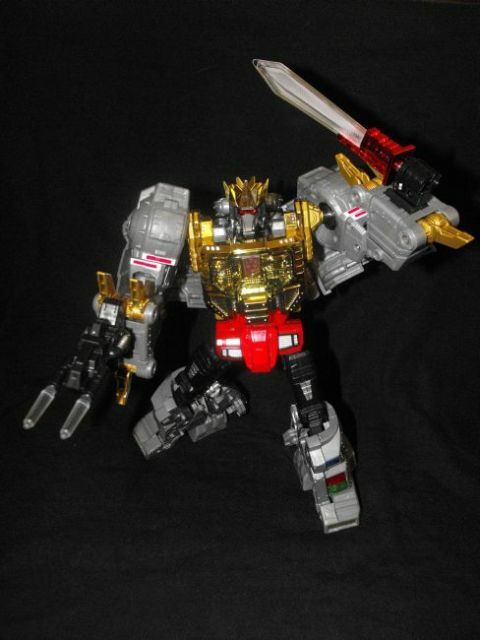 Second, the gold chrome of the chest matches the gold chrome of the Crown of Leadership (Dinobot). Pshh... like that crown is anything like the Matrix of Leadership. Me Grimlock King. Oh, ok, Me Rodimus Pwn your silly Dinobutt with the Matrix. Me Optimus Prime mash silly Grimlock into thousand slag rocks. Oh...sorry, got a little lost into the thought of the hint of jealousy the writers incorporated into the bio. As if Grimlock would betray Optimus. Ok, so back to the review, Grimlock has tons of articulation. Remember those Dinobot hips? Well the same joints are now Grimlock's shoulder joints, the arms rotate, the forearms move to and fro and the hands have articulation. Well, both have thumbs, but only the left hand has articulated fingers. The left hand has a movable thumb, index finger and then the other three fingers are one piece. The right hand has a typical G1 fist with the peg hole in the middle of the fist, but with a twist. There is a movable thumb as well. The reason for this? Part of Grimlock's gimmicktry include a red LED, that once you push the button on the back of Grimlock's right shoulder lights up. Grimlock comes with a blaster and a red glowing sword according to the box. Energo sword maybe? Not sure, honestly, the sword lights up, but nothing like the pictures I have seen online. The blaster's front end is clear and light up as well. Nice thing about the sword and the blaster is that both are interchangeable with both hands. The sword has a peg that is designed for the left hand, which has a specially designed peg hole so that the sword is stable. Did I mention the Dinobot Crown of Leadership? Yep, this is actually a cool one because it is formed to fit Grimlock's head exactly. The head sculpt represents Grimlock perfectly. The color scheme is also perfect for the character and fits the G1 Masterpiece series. Transformation Design: 9. The transformation flows easily and not overly complicated. The design fits Grimlock perfectly. Durability: 8. Grimlock's sturdy design lends little to much flaws. I did notice that the chrome came with some scratches out of the box, would have been nice if they had clear coated it as well. Fun: 10. Grimlock looks great in display, but lot of fun transforming him from robot to Dinobot mode. Aesthetics: 8. Looks great in either Dinobot or robot mode. Comes with different accessories which add to types of displays Grimlock takes. Articulation: 8. Great articulation. Lots of movable poses. Value/Price: $69.99 Toys R Us exclusive. Expensive, but it is a collector's item, the box has an odd shape as it seems that the box was designed to include minimalistic packaging. Packaging aside, Grimlock was worth the wait for me by not importing one. I decided to wait due to costs and figured any minor differences between the Japanese version and the Toys R Us release. Overall: 8. Grimlock was worth the price tag. I rather enjoy having a great version of my favorite Dinobot. Despite the smaller size than most people expected, this version of Grimlock reflects the character well. I hope that Tomy/Takara plans to release a deluxe size similar to how they released the Masterpiece Optimus Prime and then the smaller version. The Grimlock of the Classics/Universe/Generations should include a deluxe release similar to the Masterpiece. Additional: After some discussion, Grimlock seems to have wobbly hip joints, which makes him unstable. I do not have this issue with the one I bought, but seems that it is a valid point to bring up. Grimlock's robot chest symbol does not go up all of the way, which means the Autobot symbol looks just a tad off. Also, in Dinobot mode, there is a flip out Diaclone-like seat without a driver. Ah well, might work well with some of the Human Alliance drivers. I could definitely imagine Frenzy sabotaging the mighty Grimlock and wrecking havoc on some unsuspecting Autobots. Overall, I am still happy with my purchase as I seem to be the lucky ones not to have wobbly joints. If you can overlook some imperfections, this is a toy for you. Then again, if you wanted the better version, the Japanese version is still widely available online. Having this one encourages me, I might end up purchasing the King Grimlock Japanese comic book version of him. Rawr!